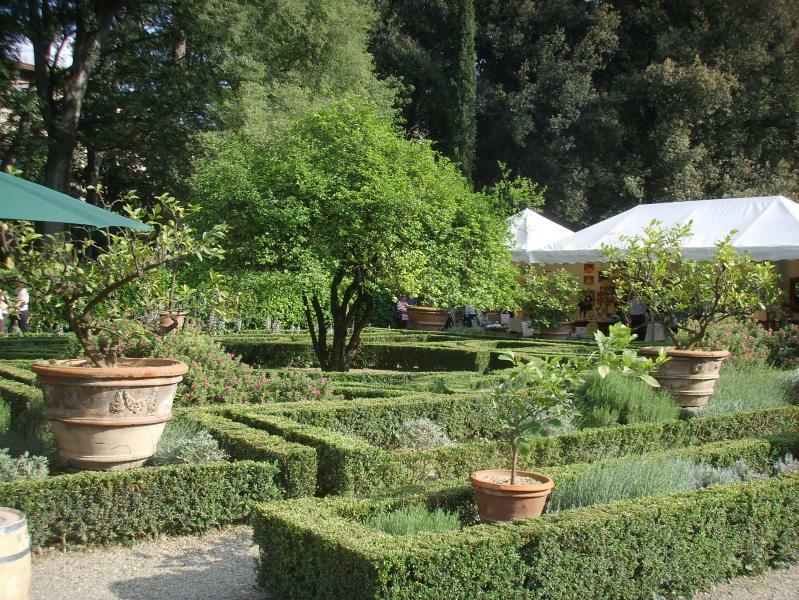 The same family who own the Palazzo Corsini owns the palace one of Florence's secret gardens, an oasis featuring 180 citrus trees, a shady hedge labyrinth, Roman states, flowers and a hundred tortoises who roam freely about as they have for the past century. The large trees that surround the property were once used as ragnaie, strung with nets to trap small birds for the spit. The palace and garden date from 1590 when botany loving Alessandro Acciaiuoli commissioned Buontalenti to design the property and provide the engineering to bring the water up for the fountains. Among the statues were the Four Seasons, now on the Ponte Santa Trínita and the statue of Bacchus by Giambologna, now in the Bargello. In 1620, after the Acciaiuoli family ran into financial difficulties, the Corsini purchased the property as a summer residence. Gherardo Silvani designed the rows of statues, cleverly lowering the pedestals in the distance to create a greater feeling of space. In 1834 the palace became the year-round residence of the marquis Neri Corsini, who added the romantic wooded groves and lake. Last renovated in 1980 with spring flowers and cherry trees, the gardens are used today for the annual Artigianato e Palazzo crafts festival in May sponsored by the Princess Giorgiana Corsini, and are slated to host the New Generation Opera Festival beginning in August 2017.